This month’s Synchroblog is centered on Race, Violence, and Why We Need to Talk About It. There’s a link list at the bottom of this post of some other bloggers also writing today. If I were going to recommend one post to read on this subject, read I Need to Say Something Entirely Different to White People on a Deeper Story. When I was thinking of what to write, this is what came to mind. I know the road ahead is long and hard and painful, but I hope we can be part of making some of these dreams come true. “And so even though we face the difficulties of today and tomorrow…” (MLK) we still have a dream. It is a dream deeply rooted in the dream of God for all his creation. We have a dream that one day the children of God will rise up and live out the true meaning of our creed: “Love our neighbor as ourselves” and that there would be no us and them, but only us. 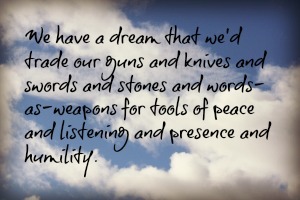 We have a dream that we’d trade our guns and knives and swords and stones and words-as-weapons for tools of peace and listening and presence and humility. We have a dream that one day on the streets of every Midwestern town, we will not see a sea of white or a sea of black, but a rising powerful wave of every color mixed and weaved together, moving on behalf of hope. We have a dream that tables in every cafe and restaurant and pub and university and library and church and school cafeteria would be filled with people of all colors side by side, eye to eye, face to face, eating together, laughing together, listening together, living together. We have a dream that even on Sunday mornings, still one of the most segregated day of the week, that we’d bravely and intentionally leave the church of our comfort and walk through the doors of our brothers’ and sisters’ communities and join in learning and listening instead of teaching and talking. We have a dream that hardened hearts would be softened and stiff necks would be loosened, and knees everywhere would be bowed in humility toward God, confessing the ways we have participated in injustice and oppression and in hate and division and racism. We have a dream that voices that have been silenced for generations begin to rise up in a strong chorus that stirs our souls and moves our feet. We have a dream that the false power of this world would be replaced with the true power of the Kingdom, where the last will be first and the first will be last, where the low will be lifted up and the high will be humbled, where there is no over or under but only alongside. We have a dream that we would raise up an army of peacemakers across all generations and shapes and sizes and theologies and politics who are dedicated to creating spaces and places of healing and reconciliation and hope and collective action. We have a dream that God would wake those who are sleeping, rousing us from their ignorance and indifference, and move our hearts to action. We have a dream that what was meant for evil could be redeemed and that even the darkest ugliest pockets of injustice could be transformed into an “oasis of freedom” and hope. We have a dream that we won’t keep waiting for our dreams to drop out of the sky but that the wild and beautiful and creative spirit of God would move through us here, now, to bring heaven to earth. A dream that we could live in a land where full equality wasn’t a dream but a reality, a practice, a way of life, evidence of Jesus-at-work-here-and-now. Yes, we “have a dream that one day every valley shall be exalted, and every hill and mountain shall be made low, the rough places will be made plain, and the crooked places will be made straight; ‘and the glory of the Lord shall be revealed and all flesh shall see it together'” (MLK). God, give us courage and wisdom and endurance and hope to participate in making this dream come true. The first thing Grace needs to hear and take stock of from me before I would talk with her is I am Adam, you are Grace now let’s stop thinking of this being about you being black and me being white, but sit down and talk about this without any victim mentality or abuse of privilege and work together on how we might go about achieving the dreams we share. It’s not all one way traffic. How else can there be any fruitful conversation? Adam, if it is any help, as another white reader, but a woman, I experienced your comment as quite aggressive. As if you were insisting on denying that you are not just you, you are also a member of a group and you are experienced as such by others. We may get to know each other and come to a point where the openness of our souls speaks to the other in utter love but before that comes later. I am sorry to read that you experienced my comment as aggressive. How do you think I perceive what you imply about me insisting on denying that I am not just me but a member of a group and am experienced as such by others when you set out to express your view “as a a woman”. I hope we can get to know each other and communicate in love. I hope you would agree that for this to work well it must be without being tribal, and with an absence of abuse of privilege or victim mentality with any conversation we have over dreams we share. Thank you for replying Adam. I don’t know how you feel about my statement but it would be helpful if you let me know. I don’t know if you have had a chance to read Wendy McCaig’s fascinating contribution to this synchroblog. Reading that I got some sense of her shock when she recognised that a black man saw her firstly as a white person and therefore in some sense a threat. I felt this was very helpful in trying to understand how we can come across to other people. And I think that it is useful If we try to do that. To walk in their shoes. That means listening to what they think, how they feel, what they feel about us. And I think we need to do that in order to get to the point where we can truly love – aware of the differences, aware of each other’s pain and or complicity in sinful structures. Love is not really expressed by saying that I will not talk to you until you stop seeing me like that and see me in the way I want to be seen. It is listening to how we are seen, sharing our feelings about that and trying to understand the others framework. Thank you for again replying with your views about the important issue over difference. I hear what you say about Wendy Craig and the shock she felt that she was perceived as a threat. I suspect there might have been something not different in that with your experience of my original comment in perceiving it as threatening. Of course you are right in asserting that love is not expressed by saying I will not talk to you until you stop seeing me like that but love and dreams cannot be shared when fear determines actions. Therefore it must be incumbent on the one feeling threatened not to falsely accuse but let love in in order to cast out fear as much as it is for the one who is perceived as threatening to be graceful, allowing for fear being someone else’s reality. This cannot happen when someone is intent on holding onto a victim mentality or using their position of privilege to oppress. Yes listening to someone’s feelings and understanding are important but of equal importance is that someone being challenged to treat others as they expect to be treated. I agree with you that it is useful for us to understand how we are perceived by other to the extend that we can. For example part of my act in comedy is that I was insulted about my race however in context the person making a racist comment was to them paying me a compliment as if to say you are one of us not them and was a sign of acceptance and honour. Strange but true. Elsewhere that I joke about how I come across as a policeman or a priest to folks where I live because I am different. I was commenting at a gig last night tht the more I am part of the coedy circuit, the more I am convinced that people who do stand up comedy are all misfits who use comedy for therapy! You mention walking in their shoes. Perhaps you have heard the saying “before you judge me walk a mile in my shoes, then you will be a mile away from me and you will have my shoes. (A little comedic variation on that) :). It’s always a pleasure to listen to someone who is primarily motivated by love. Thank you again for replying. Pingback: It's the White Man's Fault! It's the Black Man's Fault! Kathy this is beautiful but it is also challenging and uncomfortable as much of this discussion is. It is hard to accept that sometimes we are in the shoes of the oppressor whether we want to be or not. I linked to Grace’s post when I read Adam’s comment below and she is also challenging on this matter and clearly has upset some readers. Such a topic is bound to upset. Our very discomfort may be sign that we have a sense that something is wrong. yes, i agree, it is so uncomfortable and hard! and so important, too. It’s been interesting following some of the comments on these synchroblog posts. There is a commendable desire for loving communication but I’m beginning to feel that this is at the expense of really examining our own place within power structures. I’ve thought about this a lot recently and I guess I’ve come to the realisation that although the aim is to create a world of justice and peace for all of us there is going to be challenge and pain along the way. I cannot collude with those who believe that their good intentions and desire for loving relationships negates their position within the power structure. I have to face my own complicity, listen, listen and listen again to the voices of those who are hurt, damaged, excluded and oppressed by groups which include me as a white woman. White men who want people to see them as uninvolved in power structures might perhaps be better off discussing this issue with other white men who can feel their pain at being put in this position and help them work through it. I don’t think this is my work. what you are saying is so important, juliet, and a true challenge to me. when i share about some of these things, i know i am coming from a place as a white, educated privileged person and that affects so many things. i think you are getting to the heart of it all–power. oh, how we need more conversations about the reality of power! thank you for sharing.